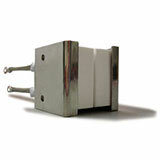 MHI Fiber Heaters may be used in both horizontal and vertical orientations with the stand shown below. The Fiber Heaters are particularly useful for optical fiber processing, especially fiber coupler fabrication or coning. Dimensions are available by calling 513-772-0404 or clicking on Contact Us. The heated fiber temperature will typically be lower than that of the heating element temperature (as it depends on the fiber). Thermocouples are not shown in pictures above but shown in picture below. 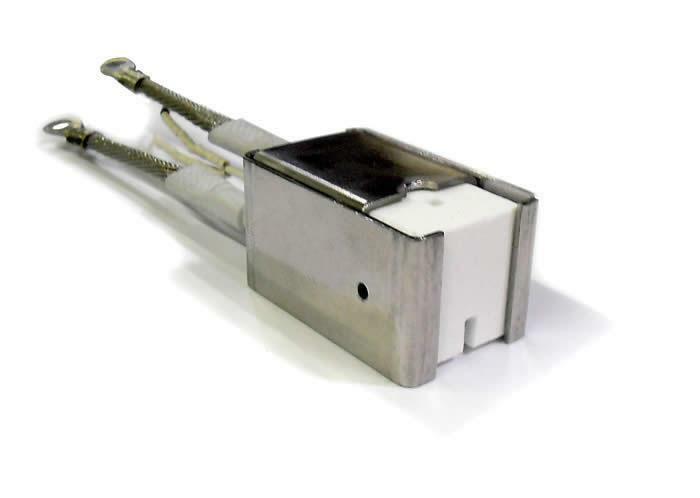 Thermocouples are included. Speciality FibHeat200-XRD model Fiber Microheater with FiberHeater available. X-Ray and Neutron Beam Ports for high temperature testing shown below. Photonic materials processing/testing is feasible. Note that high power units have slightly slanted slots to accomodate multidirectional use-ports. MHI provides a calibration curve custom to your application. Nominal uniformity profiles (only when available) are also available by contacting us. 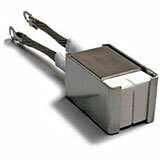 All MHI Fiber Heaters utilize MHI's patented heating elements. Note that slot and hole directions are interchanged in the 75mm version. See further below for more description. MHI's BPAN-O-PLUS and Data Acquisition System closed loop control system, with over-temperature protection, is available for MicroFiber™ Heaters and Fiber Heaters. Compare price with the on-line form below. Please visit testimonials page for references./ MHI Control Panels will be shown on the quote when requested. Please inqire about UL and cUL. 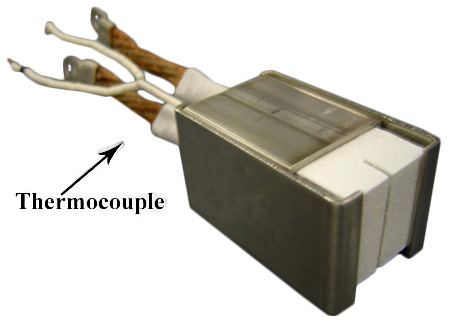 Thermocouple location is shown below in the photograpgh. Please note that the exact location differs between models or may be located so as to not interfere with a sample or a beam. 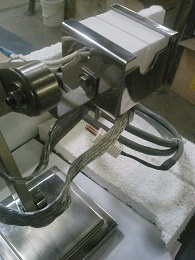 A typical MHI multi-axis flexible stand for the fiber heaters is shown below. The profile varies with installation and fiber slots sizes. Its is very uniform - regardless the ends can be cooled to get sharper drops. 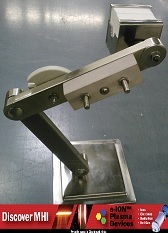 MHI Flexible Stand with Easy Connectors.MHI Mutipurpose (and Multi-axis) Stand with Thermocouple shown. 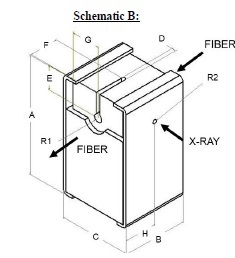 Specialty Fiber Types Heating Elements. 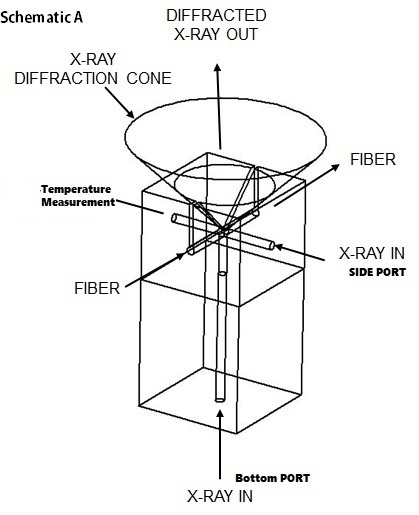 Model FibHeat500-THM-XRD Fiber Microheater with X-Ray and Neutron Beam Ports for High Temperature Testing. Please note slant angle slit for high power models which ensures greater uniformity. Note that the XRay-beam-in and diffracted-beam-out (with more than 90 degrees) can be made in several ways as shown in the schematics. The sample may be placed in the slot or in the hole and the diffracted beam can be from half-slot or the top. Please advise MHI your preference after selection of the THM model. Double slit - not a problem to access a cone of X-rays/Neutron Rays..
Customization possible for large volume orders; please call us at (513) 772-0404 to discuss.